According to Maria Isabel Gonzalez, Vice President of the company, the portfolio of opportunities includes 12 other projects that will involve the creation of new joint ventures for the development of hotels in Covarrubias (Las Tunas), Havana and Santa Lucia. According to Gonzalez, they also promote another 12 proposals under the hotel management contracts modality, which is in line with the intention to raise the standards in the presentation of services of Cuban facilities, in alliance with experienced foreign chains. Yesterday, during the South American Conference of Investment in Hotel and Tourism (SAHIC), which ends today in this capital city, it was known that in the current year, Cubanacan transferred the management of the hotels Copacabana and Tropicoco , in Havana, to the Spanish firms Be Live and Valentin, respectively. 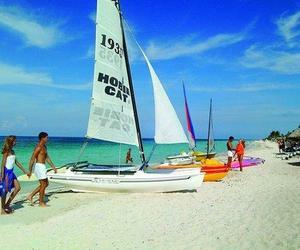 That Cuban group also extended its relationship this month with Spain´s Iberostar chain, which will manage 650 rooms more in Santiago de Cuba, Jardines del Rey, and the city of Gibara, in Holguin, presented as a tourist destination in the recent International Tourism Fair. Created in 1987, Cubanacan owns more than 90 hotels in Cuba, some of them operating jointly with prestigious international chains such as Meliá, Blau, Iberostar, Breezes and Blue Diamond. Official data show that there are in Cuba 25 joint ventures in the tourism area and there are 82 hotel management contracts with 19 foreign managers, for a total of 41,000 rooms, which represents 62 percent of the existing ones.